Delivering innovative and efficient solutions. At Ramaker & Associates, our dedicated architecture and engineering professionals have the knowledge and experience that allows us to go above and beyond for our clients. As we monitor the latest industry issues and trends in our core markets, we search for new technologies and efficiencies that will benefit our clients and their projects. Our expertise is continually being confirmed by referrals to new clients and repeat business from our longstanding clients. It is our goal to provide our clients with the highest quality architectural and engineering services in the most efficient way possible. To accomplish this goal, over the years we have added a variety of in-house services so we can function as a single source for all our clients' architecture and engineering needs. The waterpark includes six WhiteWater waterslides; a FlowRider; activity pool with play features; wading pool with a multi-level play structure; small features and play areas for young children; offerings for both children and adults; lazy river with beach entry; and a wave pool. 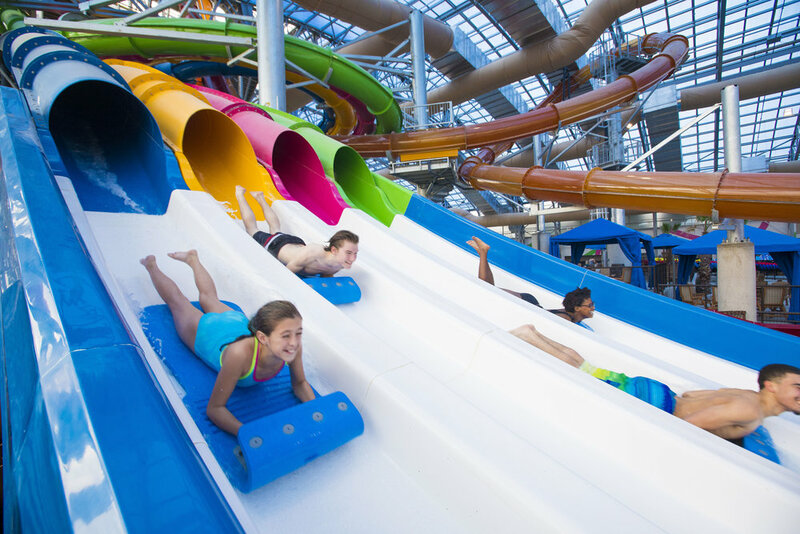 The waterpark building program also includes an OpenAire retractable roof and wall systems; movie screens, video and projection equipment; LED light displays/features; party rooms; snack bar and restaurant; sports bar; retail store; arcade; cabanas; landscaped outdoor space with beach and deck areas; locker rooms and bathroom facilities; lifeguard staff area; building mechanical area and pool equipment rooms. The pools and features designs were developed in a manner that complements and is cohesive with all components.